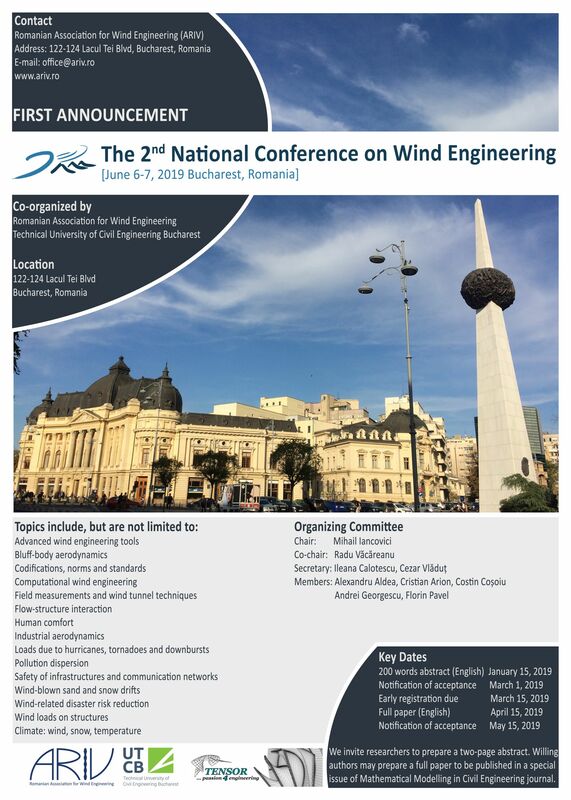 The Romanian Association for Wind Engineering (ARIV) and the Technical University of Civil Engineering Bucharest (UTCB), under the auspices of the International Association for Wind Engineering (IAWE), are very pleased to invite you to join the 2nd National Conference on Wind Engineering (2NCWE 2019) on June 6-7, 2019 in Bucharest, Romania. We invite academics, researchers, practitioners and students to actively participate and share their research, exchange state-of-the-art findings as well as practical applications, and to further enhance cooperation in the vast interdisciplinary field of wind engineering, ranging from wind loads on structures, the use of wind power, air quality or urban climate. The conference brings therefore together not only researchers but also structural engineers, computational and software engineers, mechanical engineers, meteorologists and environmental engineers. Our website http://2ncwe.ariv.ro/ will keep you continuously updated. We look forward to have a wonderful time together at UTCB, in June 2019. Welcome to the 2NCWE 2019!